Our office offers a full range of general dentistry procedures, which are too many to list below. If you have any problems you would like us to address, or would like information about a dental procedure you may have been recommended or may have heard about, please let us know. We are always happy to share, teach, educate and answer questions. Zoom! whitening is a great way, especially for patients who have busy schedules or have other reasons for being irregular with their bedtime routines. After our assistants form a blocking layer around your soft tissue, the whitening gel is combined with an activating light to immediately brighten your teeth. Some patients who have sensitive teeth ask for a fluoride application a little before Zoom whitening to prevent sharp "zings". Also, Advil may be helpful to avoid sharp "zings" which are sometimes associated with whitening during or just after the procedure. Patients sometime bring headphones to help time go by faster with either music or video on their smart-phones. Our office offers a bundle priced take-home whitening kit (with custom made trays included) for periodic touch-up whitening. Some patients prefer a slower- and self-paced whitening system that they can use at home. 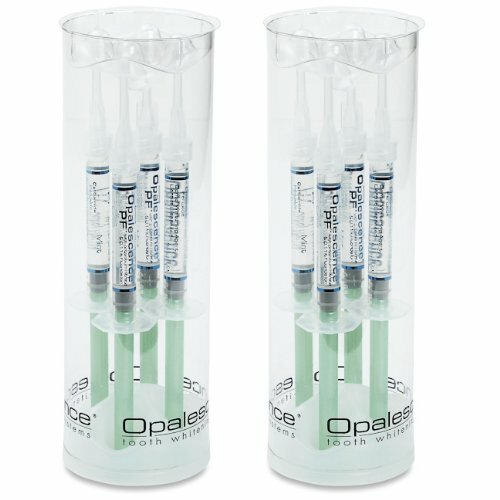 Using this self-paced system, more or less whitening gel may be used as desired. Also, whitening sessions can be done multiple nights in a row, or spread out over alternating evenings. Some studies show that whitening performed slowly over multiple nights actually achieve a longer-lasting whitening effect. 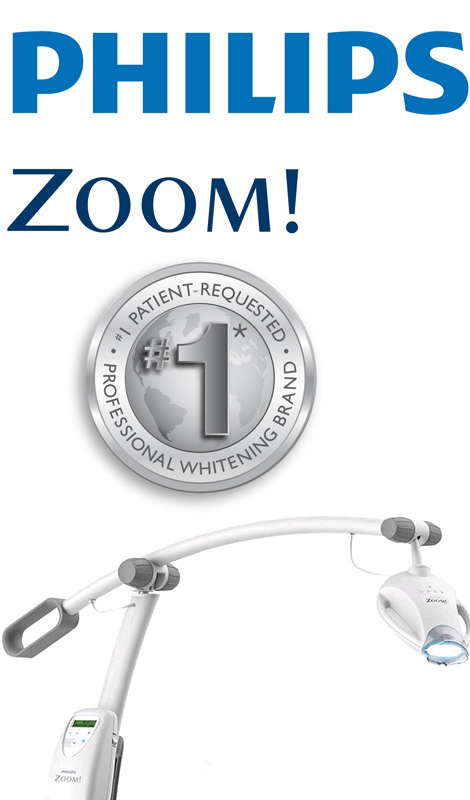 However, patients who may not have the time to use a self-paced system may prefer Zoom whitening which is started and finished in a single session. Refill kits are offered at our office, which allows periodic touch-ups weeks or months after initial whitening. Taking it one step further, our office has a unique $800 discount offer which includes the full Invisalign treatment, PLUS an Invisalign retainer at the end of treatment, PLUS a dentist-supervised professional teeth whitening, PLUS a $800 bundle discount . Simply put, our office offers all three of these services for less than what other dentists charge for just the Invisalign treatment alone. 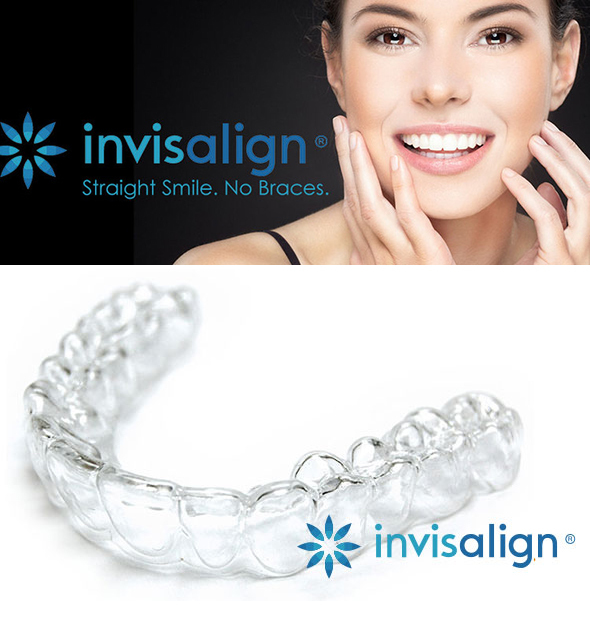 Call us today and ask our patient coordinator about our Invisalign bundle. Modern dentistry no longer places metal-based (including mercury) amalgam fillings. Not only are there concerns about mercury and other metals, the fact is that amalgam fillings are basically soft metals that are "packed" (pushed) into place. Over time, through use and other wear, all amalgam fillings open up and allow bacteria and cavities to form. Although we wouldn't replace existing amalgam fillings just for the sake of replacing them, we do inform our patients that all amalgam fillings eventually fail and that replacing them is just a matter of time. For some patients, "leaking" amalgam fillings go unnoticed for too long and severe damage can occur before a dentist detects a failed amalgam filling. For that reason, when an amalgam filling first begins to fail, it is usually a good idea to discuss replacing them sooner, rather than later. 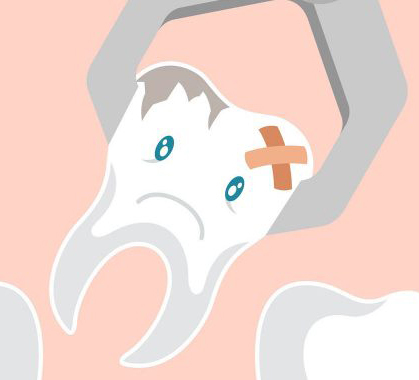 When a tooth has structural damage that cannot reasonably be addressed with a filling, a crown is recommended in order to provide a long-term solution. Placing a large filling which is located in an area that receives a lot of biting or clenching pressure can quickly lead to a sheared / cracked tooth, and in many cases will lead to a root canal because of the new damage. To provide a crown, the tooth to be restored is prepared by a dentist with enough reduction for the new crown to have enough space on all five surfaces. 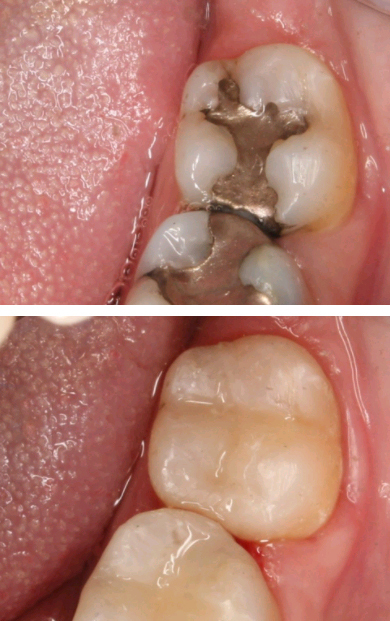 In modern dentistry, crowns no longer have metal sub-structures. Instead, modern crowns are based on tooth-colored substructures, in addition to the life-like porcelain provided to match your existing teeth. A "bridge" refers to several crowns that are connected to each other. When one or more teeth are missing, a bridge is used to replace the missing tooth / teeth. A great alternative to a bridge, especially when just one tooth is missing, is to consider a dental implant. One rationale is to avoid reducing two otherwise healthy adjacent teeth just to replace one missing tooth. Our office partners with expert oral surgeons and periodontists, who place the dental implant. After healing, our office will "restore" that implant with a permanent implant-crown. When a tooth decay reaches the root area, the nerve inside the tooth starts to get infected and eventually dies. During the infection period, patients experience extreme discomfort or pain. When the pain gets so bad that sleep is repeatedly interrupted, root canal therapy is almost guaranteed. Contrary to popular belief, root canal therapy is not painful. It is actually the days or weeks leading up to the treatment that is the painful period. In modern dentistry, extraction is usually a last-option. Some patients choose to pull a tooth that requires root canal therapy for financial reasons. However, after the extraction, the adjacent teeth and bone have a tendency to "cave in" over time because the adjacent "anchoring" tooth has been removed. When that happens, an implant is normally recommended, which ends up costing much more than the root canal therapy. Sometimes, a tooth may be cracked so severely that a crown or filling will not be possible. In those cases, an extraction may be necessary, normally followed by a dental implant in its place. 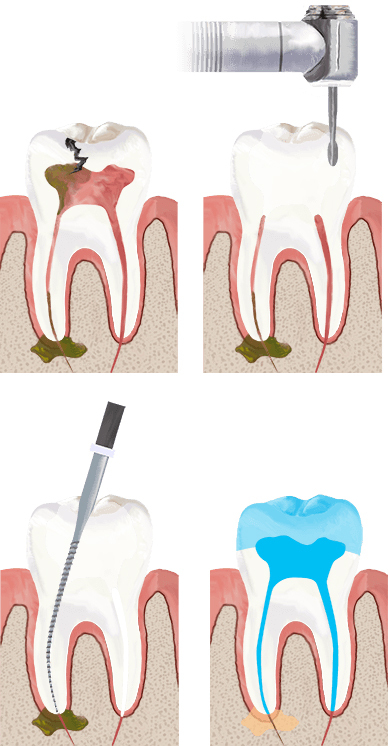 After extracting a tooth, the immediate placement bone granules is often recommended to prevent or delay the "cave in" effect if the extraction hole is left unfilled.